There’s nothing more blissful than forking through a fluffy slice of Angel Food Cake with lemon curd on a warm summer day. The classic low fat dessert is a popular North American staple often enjoyed in June and July as fresh berries and stone fruits get plucked up on local farms. If you find yourself overloaded with eggs this sweet confection allows you to easily divide up the egg white (whipped into a frothy meringue for your cake) and yolks (which act as a thickening agent for your sweet curd). 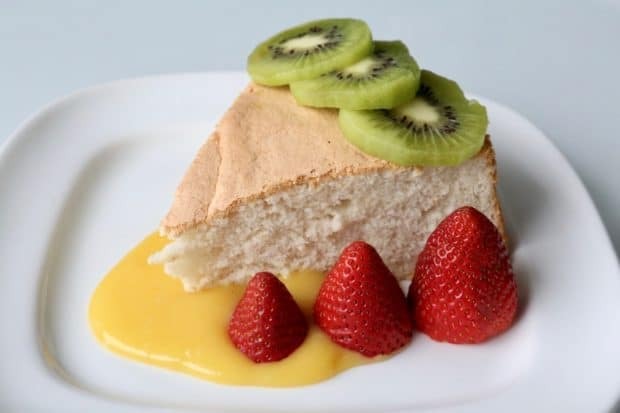 if you don’t own an angel food cake pan don’t fret, you can easily use a springform pan as a replacement just line the bottom of your pan with parchment paper so it easily removes after being cooled. only use an un-greased pan as you want the frothy cake batter to rise up during baking and cling to the sides, maintaining an airy crumb rather than collapsing in on itself. Once cooled you can easily remove the cake from the pan by gliding a knife around its edges. once your cake comes out of the oven be sure to invert it immediately, letting it cool while hanging upside down. This ensures your cake does not collapse as it reaches room temperature. With a mixer, beat egg whites on medium-high until foamy, about 1 minute. Add cream of tartar; beat until soft peaks form. Continue to beat, gradually adding sugar; beat until stiff peaks form, about 2 minutes. Add vanilla and beat to combine. Gently transfer egg-white mixture to a large, wide bowl. In four batches, sift the flour and salt over egg-white mixture. While turning the bowl, use a rubber spatula to fold in the mixture by cutting down the centre and coming up the sides. Gently spoon batter into an un-greased angel food cake pan with a removable bottom; smooth top. Cut a knife or small spatula through batter to release air bubbles. Bake until cake is golden and springs back when lightly pressed, 35 to 40 minutes. In a medium saucepan whisk together sugar, zest, and egg yolks; whisk in lemon juice and salt. Remove pan from heat while continuing to whisk. Pour curd through a fine-mesh sieve into a glass bowl. Press plastic wrap against the surface of curd and refrigerate until cool.